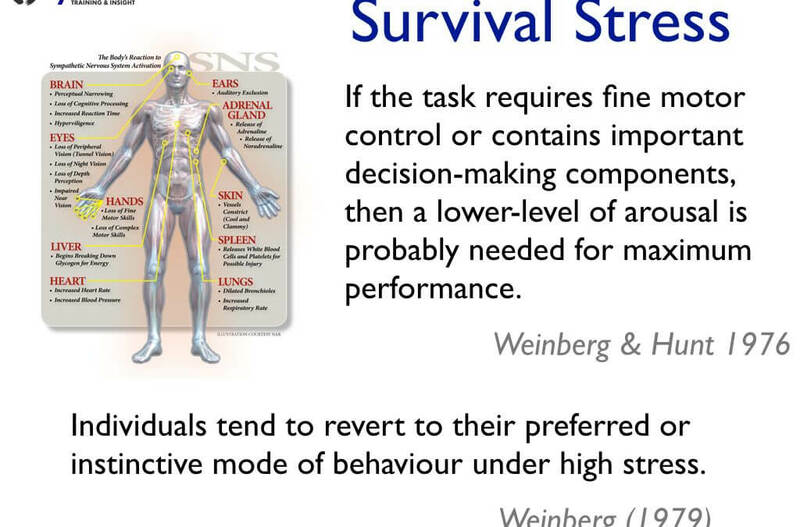 Since the 1970s it has been recognised that stress impacts performance. These impacts can be either negative or positive depending on intrinsic factors, extrinsic factors and the training the person is engaged in with respect to the target activity. In our case, dealing with the prevention and management of violence and aggression, we can guarantee that the trainees we are working with will have to apply their skills in high-stress scenarios. In order to design and deliver high-impact, valuable PMVA training, here are a couple of concepts that expert PMVA trainers need to keep in mind. The information comes from a slide we used in our presentations to the national-level healthcare and justice institutions we visited some years ago. They invited us to talk about the ways they could modernise and upgrade their training to deliver effective PMVA, Self-Defence and Physical Intervention packages.